Cultural Survival of Sri Lanka has spearheaded efforts to facilitate dialogue between the Government of Sri Lanka and its indigenous citizens. Above: Senior parliamentarians including Deputy Speaker Hon. 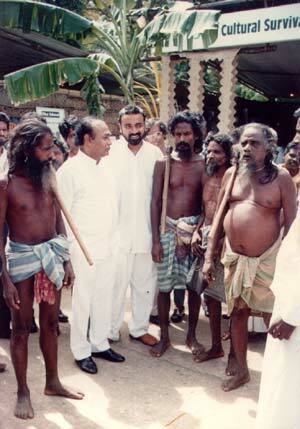 Gamini Fonseka meet Wanniyalaeto elders under Cultural Survival auspices in December 1992. Cultural Survival's almost single-handed role in spearheading efforts to commemorate the International Year has resulted in the creation of a National Committee for the International Year for the World's Indigenous People sponsored by the Ministry of Environment. Cultural Survival continues to take the lead in planning and implementing measures designed to enhance public appreciation of indigenous culture and further the objectives of the United Nations-sponsored International Decade for the World's Indigenous People (1994-2004). Cultural Survival also participated in the inauguration of the International Year at United Nations Headquarters in New York on 10-11 December, 1992, and was appointed to the International Committee for the Year.